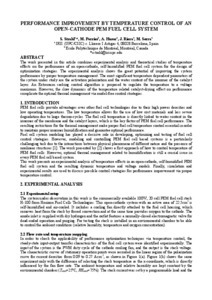 Strahl, S.; Perrier, M.; Husar, A.; Riera, J.; Serra, M.
The work presented in this article combines experimental analysis and theoretical studies of temperature effects on the performance of an open-cathode, self-humidified PEM fuel cell system for the design of optimization strategies. The experimental analysis shows the great potential of improving the system performance by proper temperature management. The most significant temperature dependent parameters of the system under study are the activation polarization and the water content of the ionomer of the catalyst layer. An Extremum seeking control algorithm is proposed to regulate the temperature to a voltage maximum. However, the slow dynamics of the temperature related catalyst-drying effect on performance complicate the optimal thermal management via model-free control strategies. Strahl, S. [et al.]. Performance improvement by temperature control of an open-cathode PEM fuel cell system. A: International Conference on Fundamentals & Development of Fuel Cells. "Proceedings of the 5th International Conference on Fundamentals & Development of Fuel Cells". Karlsruhe: 2013, p. 1-8.